Despite the minor deviations from the original, the salad was still delicious, and surprisingly filling: neither of us managed to finish our plates. The combination of flavours - from the slight bitterness of the chicory to the sweetness of the figs and pomegranate seeds, the tangy creaminess of the buffalo mozzarella, and the peppery kick of the rocket leaves - was fantastic. Topped with a drizzle of good quality olive oil, and some seasoning to taste, and it was done: an impressive looking starter or main in under 5 minutes. Peel the leaves from the heads of chicory and lay them onto the plates. Sprinkle the rocket leaves on top, followed by the pomegranate seeds. 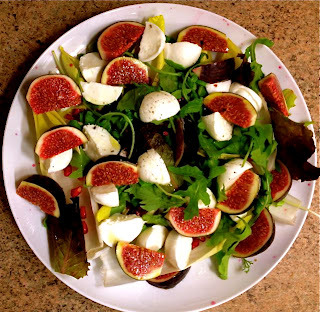 Quarter the figs, slice the baby buffalo mozzarella balls (or, if you're using 'adult-sized' balls, chop into rough cubes), and place both on the salad - artistically if you can! Drizzle with olive oil, season with sea salt and black pepper...and voila! You're good to go.